Losses were broad. The markets in every developed country ended down for the year, except New Zealand, which held flat. Overall, we saw 46 of the 47 countries tracked by the MSCI All Country World Index (IMI) fail to post a positive return. The outlier? Qatar. Not only was Qatar the only up market for 2018, it was way, way up. It was up 27.1! The worst emerging market, Turkey, was down 41.3%, a spread of almost 70%! Even more surprising, Qatar was one of the worst-performing countries one year earlier. For 2017, Qatar was down 12.5%. And that was in a very strong market year. More likely, the types of investors prone to move money about to chase return might have very well decided to get out of Qatar in 2018 after their zero-star performance in 2017. Now let’s play a little game. Can you guess the market’s reaction to each of these headlines? Did worldwide markets move up, down, or just ignore the news? We’re on the honor system here …. Some of these market reactions make perfect sense. 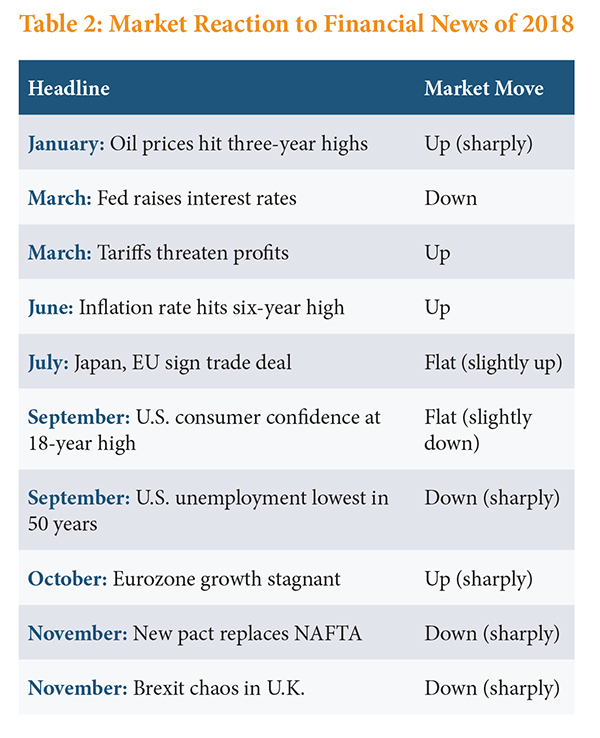 While strong economic indicators drove the Fed to raise interest rates, that move signaled to the markets that the era of easy money (low interest rates) might be ending, leading to a slowdown in growth. And British Prime Minister’s Teresa May’s ongoing failure to strike a deal for the U.K.’s exit from the European Union (Brexit) provided the type of uncertainty that markets hate. But many of these events led to unpredictable market reactions. Why did the markets not react positively to high consumer confidence? If fear of inflation drove markets down in September when extremely low unemployment (an inflation indicator) was reported, why did markets move up when we saw actual inflation spike higher in June? These quandaries are the reason I feel blessed in this life to have majored in finance and not economics. It’s a fun game to play: “Guess What the Market Will Do.” You can make it a drinking game: Down a shot every time you guess wrong. Just be careful of alcohol poisoning. One game you don’t want to play is “How Should I Move My Money?” Oil prices are spiking. Is it time to move to cash? Tariffs are slowing imports. Should I sell my international stocks? Qatar is plummeting. Should I move my investments to Turkey? Given that the experts and conventional wisdom seem to be wrong at least as often as they are right, this game could lead to retirement poisoning. The best course of action is not to play. Older PostWhy Stay Invested (When We Know Markets Are Going Down)?